We understand how frustrating a cracked or broken Lenovo ThinkPad Edge E430 screen can be; that's why we ship all of our screens out quickly whilst ensuring access to tips and advice. Below,you'll find easy to follow, step by step instructions that will aid you in the Lenovo ThinkPad Edge E430 screen replacement process. Disconnect any (and all,_ peripheral devices attached to your laptop, (eg, speakers or memory ticks.) Next, unplug your laptop form the mains power and remove the battery. Located in each corner of the front bezel, you should see four aesthetic covers. Use your fingers or a flat edged implement, (a razor or guitar plectrum,) to prise the aesthetic covers away from the front bezel. Next, unscrew the screws hidden underneath these aesthetic covers and, set them aside safely. 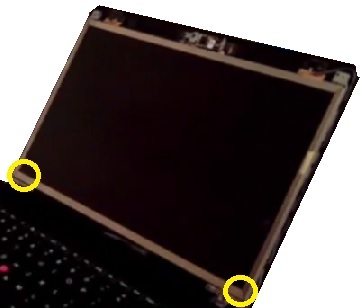 Use an implement or your fingers to prise the front bezel away from the laptop. Work your way around each edge of the bezel, easing it away from the rest of the screen casing. When you have sufficiently loosened the front bezel, lift it free from the laptop and, set it aside safely. Remove the screws, (two in total; one in each corner,) form the bottom of the exposed screen. 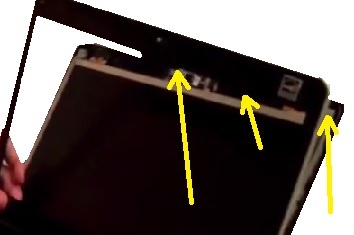 Take hold of the top of the broken screen and carefully pull it towards you, (releasing it from the rest of the screen casing, in the process.) Lay the screen, face down, on the laptop keyboard. Next, disconnect the thick cable attached to the back of the screen. Then, remove the screws, (six in total, three on each side,) from the sides of the broken screen. 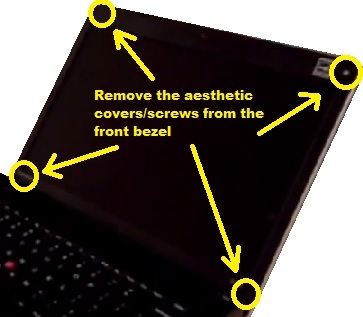 Remove the broken screen from your laptop, To fit your replacement Lenovo ThinkPad Edge E430 screen, simply follow the instructions, (as outlined above,) in reverse order.